Ultrasound is the gold standard for examining abnormal pelvic masses to differentiate between a cyst and a solid mass. It cannot differentiate, however, between a benign solid mass and a malignant one. PET scans showing metabolism and blood flow within an area can provide more information about malignancy, but localizing the pathology can be a problem without CT. Putting PET/CT and ultrasound scans together yields an image with the benefits of both. A method of automatically combining CT, PET, and ultrasound scans into one image may help clinicians diagnose gynecological cancers. Together, the three modalities provide a clearer picture of indeterminate solid masses in the pelvic area. By registering ultrasound with CT, we automatically registered the ultrasound with the preregistered PET scan as well, providing a level of functional imaging over the two sources of anatomic imaging. We used a slice-to-volume registration method previously applied to MR images for this application. Fusion of PET, CT, and ultrasound images for improved diagnosis of gynecological cancer. Top: PET, CT, and ultrasound images of same patient. Bottom: Three-D fusion of three imaging modalities. 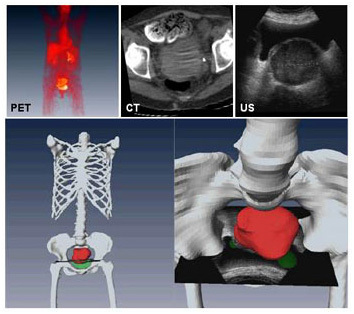 Combined PET/CT provides both anatomic (bone in white) and pathologic (tumor in red) information. At right, ultrasound image registered with PET/CT demonstrates malignancy of mass in pelvic area.